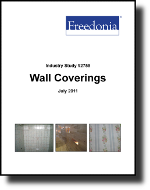 US demand for wall coverings is projected to advance 8.2 percent annually through 2015, from a weak 2010 base. Wall panels will remain the dominant product type and grow the fastest, with finished gypsum board panels and solid wood panels seeing the best gains. The residential market will outpace the nonresidential sector.